In the New York Times, John Wilson reviews a new Muir biography, A Passion for Nature: The Life of John Muir, by Donald Worster. The nature lover and conservationist John Muir is at once famous and indistinct in the minds of most people. Doubtless there are ardent souls who could give a credible account of his life, but not many — not even among those who share the passion that led Muir in 1867, at age 29, to embark on a thousand-mile walk from Indiana to the Gulf of Mexico and drove him to continue rambling hither and yon throughout his long life. Muir is revered but remote. He needs a substantial biography to bring him into focus. It is incorrect to suggest that this is the first Muir biography, but this does sound like an interesting book for those who want to know more about Muir that that which the Muir myth tells us – and I count myself in that group. I just saw the article on Bob Coomber at SFGate – check it out. “Bob Coomber cannot walk, but he sure can hike. In a contest between Bob and Kilimanjaro, my money is on Bob. Remembering Dean Conway A part of Yosemiteís history died when Dean Conway passed away on June 6, 2008. Conway was a legendary packer who packed in to the High Sierra people from all walks of life, along with at least one future president, film crews, and celebrities. Follow the link to the original West Coast Imaging Blog story to hear about the author’s meeting with Conway, and then follow the link to the Fresno Bee article for further stories. 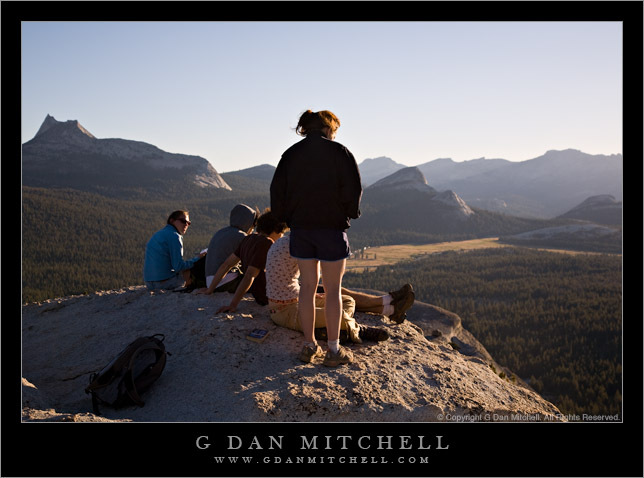 Golden Hour on Lembert Dome – Tuolumne Meadows. Yosemite National Park, California. July 21, 2007. © Copyright G Dan Mitchell. I thought that this image of summer might be a nice end of year photograph – not only is it a nice memory of last summer, but it reminds me that the days are now getting longer and leading toward yet another summer. “We face a true planetary emergency,” Gore said. “The climate crisis is not a political issue, it is a moral and spiritual challenge to all of humanity. It is also our greatest opportunity to lift global consciousness to a higher level. Mike Cassidy talked to Bob this week and the story ended up on today’s front page. Tom’s sidebar. Summation: it never felt so good to be proved wrong. Coomber, 52, who lives in Livermore, is not one for the overly dramatic. As we talked in the office building where he works for Wells Fargo’s auto financing division, Coomber explained that he wasn’t out to make some profound statement about overcoming adversity. And that is quite a statement, in my view. California’s great outdoors still will be around after Saturday. But I won’t. Well, not at this particular newspaper, I mean. After 22 years of pounding the outdoors beat for The Chronicle – and sometimes getting pounded by it – I’m about to fold my tent and take a hike. And yes, I do mean that literally. For me now, as the song says, the time has come to say sayonara. Not farewell to writing on these topics about which I care so much, no sir, no way. And not farewell to many other forms of work. Only, to practicing the craft at this particular venue. I plan to devote myself to larger projects, those grand pieces of artistry I’ve always lusted after, but never found enough time to address very well – you know, novels, plays, poetry. I’ve got a satchel full of pocket notebooks dating back to the teen years, and it’s getting on toward high time to crack ’em open and energize their contents. I’ve enjoyed subscribing to his RSS feed from SFGate and reading his articles Good luck to Paul! "Like the Seasons Changing, He Just Kept Coming"
I’d been told by the team that once onto the final switchbacks it got flatter and easier. I was completely demoralized, once there, to find the opposite. The rocks filling the “road” were bigger and harder to gain traction. So much for the differences in perception of hikers and wheelchair hikers! But light was beginning to fade on the east side of the peak, and a cold rush of urgency spurred me to just look down and push forward. This was some kind of demon’s joke! It got so much more difficult and I was in so much pain that I felt like just sitting there, stopping and hoping something would change. I looked up, and the Summit Lab seemed almost within touching distance, all of a sudden! Yow! Maybe it’ll finally happen, ya think? I came up the final two turns, cursing like a drunken sailor at every rock, every slippery patch….and of course the final 20 feet were the toughest. It took all I had left to churn around the corner and suddenly be level with the Summit Lab, Summit Register…I was almost in tears. Only exhaustion kept me from completely breaking down like a kid on Christmas morning after getting his Red Ryder BB Gun. Tom, Rick and Cheryl took photos, and there was a completely unforced whoop of elation from everyone. Ten hours and 45 minutes after we’d set off, at 6:44 PM I made the summit – 14,246 feet. August 27, 2007 Posted by gdanmitchell | News, People	| Comments Off on "Like the Seasons Changing, He Just Kept Coming"